Gigabyte's GA-P55-UD5 socket-1156 motherboard is an enthusiast grade Intel P55 Express platform with a ton of extra features packed into it. Along with the obvious support of Intel Core i5 and Core i7 800-series socket 1156 processors, the GA-P55-UD5 board features three physical PCI Express x16 2.0 slots that support both ATI Crossfire and NVIDIA SLI modes (in x16/x8/x4 modes, x8/x8 when using two videocards). 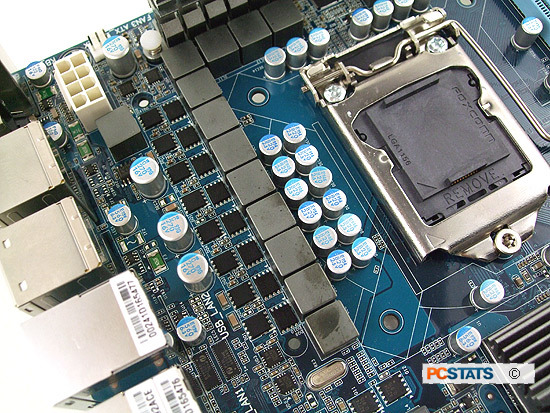 It also has two PCI Express x1 and two legacy PCI slots for additional expansion options. There is a quirk when using the last PCI Express pink slot that operates in x4 mode that will disable the rear eSATA and both PCI Express x1 slots because of shared bandwidth... so it's almost pointless from a practical standpoint. Memory support on the GA-P55-UD5 comes via four DDR3-1333/1066/800 slots that will accommodate up to 16GB of RAM (8GB in 32-bit operating systems). True to its enthusiast leanings, memory can be overclocked to run at DDR3-2200 speeds with compatible modules, and the board includes support for Extreme Memory Profile (XMP). 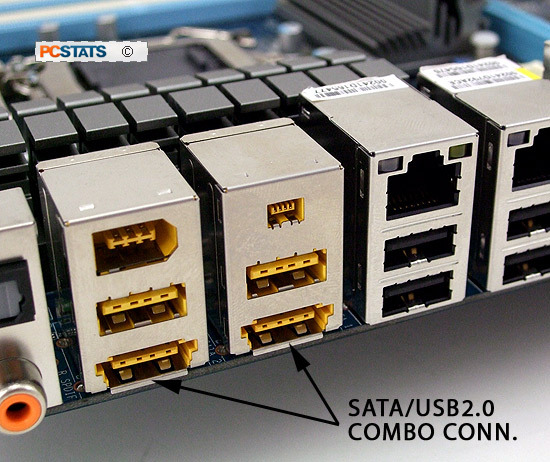 In terms of data storage the GA-P55-UD5 board is equpped with no less than twelve 3Gb/s SATA II connectors; six via Intel's ICH10R, four from two Jmicron JMB362 controllers, and another two from Gigabyte's own SATA2 controller. A further two eSATA jacks on the back I/O of the board offer up RAID 0,1,5 and 10 mode - any way you look at it the GA-P55-UD5 can host some seriously large hard drive or solid state drive arrays.... though on this model 6GB/s SATA III is not supported, for that look to the otherwise identical GA-P55A-UD5 model. Rounding out the features on the Gigabyte GA-P55-UD5 board are fourteen USB2.0 ports (but no USB3.0), two Firewire ports a pair of Gigabit (10/1000)network jacks and one IDE connector for legacy devices. High Definition 8-channel audio comes standard as does support for Dolby Home Theatre, and multi-videocard gaming options like ATI CrossfireX and nVidia SLI. Running multiple videocards can significantly improve performance and will give the GA-P55-UD5 some extra staying power as well. As one of Gigabyte's more feature-rich motherboards, the GA-P55-UD5 motherboard retails for around $220 CDN ($230 USD, £135 GBP) through stores like NCIX, CanadaComputers , Misco.co.uk or NewEgg. 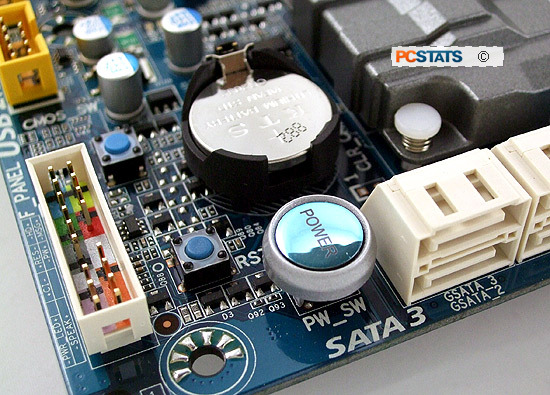 Just one rung underneath the double-stuffed smorgasbord Gigabyte GA-P55-UD6 platform PCSTATS has on the test bench this week. For most people interested in Intel's Core i5 processors and all that's available via the P55 Express chipset, the GA-P55-UD5 will be more than enough and not break the bank. Of course, since this a Gigabyte motherboard, the entire thing gets the Ultra Durable 3 treatment. Ultra Durable 3 is a marketing name for mix of components, manufacturing technologies and software controls that Gigabyte has added to all of its motherboards. In testing PCSTATS has seen positive although small results from its Dynamic Energy Saver tools. The GA-P55-UD5 board uses a 24-phase power supply and special Japanese made capacitors and MOSFETs to (theoretically) improve its longevity - generally known as 'Ultra Durable 3' by the manufacturer. 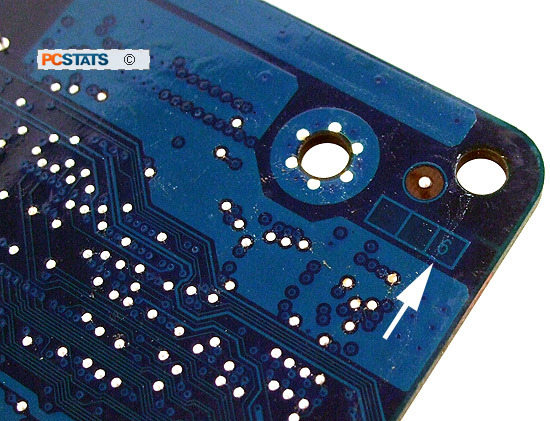 From its 6-layer PCB with 2oz. copper substrate, to the Japanese made solid state capacitors and electrical components, the energy saving features built into it, Gigabyte is certainly pulling out all the stops. Gigabyte hasn't stopped there though. There are a lot of motherboards that will be based on Intel's P55 Express chipset, and standing out from the crowd is more difficult than ever before. Gigabyte's Smart 6 is a suite of software programs that work with Gigabyte's motherboards to speed up and expand the capabilities of your computer system. PCSTATS will be taking a closer look at the Smart 6 in a moment. Once you begin building a new computer system with one you quickly realize where extra time has been spent to make your life easier. 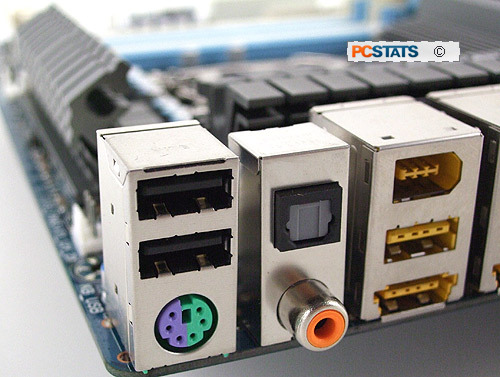 Gigabyte is going to be facing stiff competition from ASUS and MSI Computer on the Intel P55 Express front, so here are a few of the refinements PCSTATS noticed on the GA-P55-UD5 board. Big power switch and easily accessible hard reset and CMOS clear buttons. I almost always have to fix LED front panel header cables because the polarity on the LED cables gets mixed up, Gigabyte add polarity indicators and printing inside the header to clearly indicate which ports are USB2.0, and which are Firewire. Combination PS/2 keyboard and mouse jacks are damn handy. Most mice are USB, but there are many keyboards still in use for PS/2. Though legacy, PS/2 keyboards from years gone by have better tactile features than the newer, extremely inexpensive and flimsy keyboards being sold today in PC stores (dare I say, even the plastic is not as nice as my old clunker IBM keyboard!). Combination USB2.0 and eSATA jacks are great if you have no use for eSATA in the first place. But really the point of these hybrid USB/eSATA cable slots is to provide power from the USB2.0 port to an eSATA device over one hybrid cable. eSATA alone is unable to power an external hard drive for example, but there is enough electricity from a USB socket to power that device. The Gigabyte GA-P55-UD5 motherboard is built on a 6-layer PCB, and according to the manufacturer 2 oz copper substrate is used for the inner grounding layers. The thicker layers of copper aid in "the cooling of board mounted electrical components" and lower electrical impedance. PCSTATS toured a massive ECS factory in Shenzhen China last year where several million motherboard PCBs are fabricated each month. Trust us when we say, the more layers to a motherboard the more difficult it is to make and generally speaking, the better the quality. One of the other interesting changes happening to motherboards lately is the quality of components used in their construction. Wouldn't it be amazing if car manufacturers did the same thing.... the new Ford F150, made from stainless steel so it will never rust! 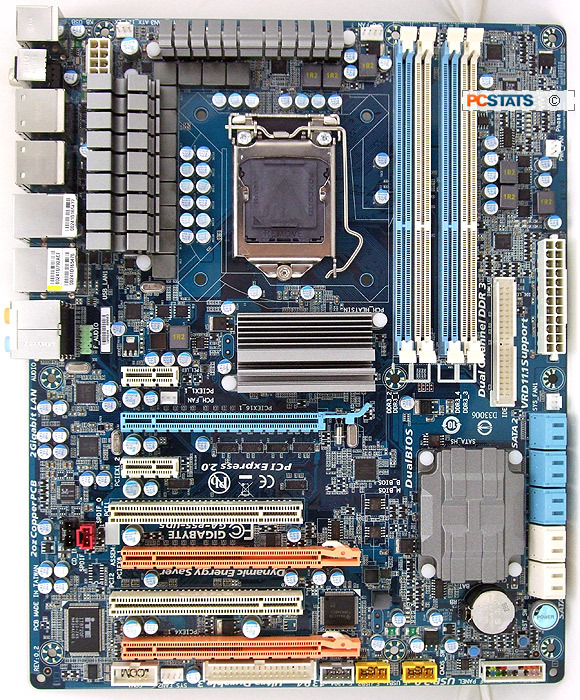 Anyhow, Gigabyte's GA-P55-UD5 motherboard features a 24-phase power supply for the socket 1156 CPU, shown above. The small black squares are low RDS MOSFETs, the larger grey cubes are Ferrite choke cores and the aluminum tins are Japanese made solid polymer capacitors - almost every motherboard is using these capacitors nowadays, but some lower quality brands actually use electrolytic capacitors in tins that look like those above to fool you!